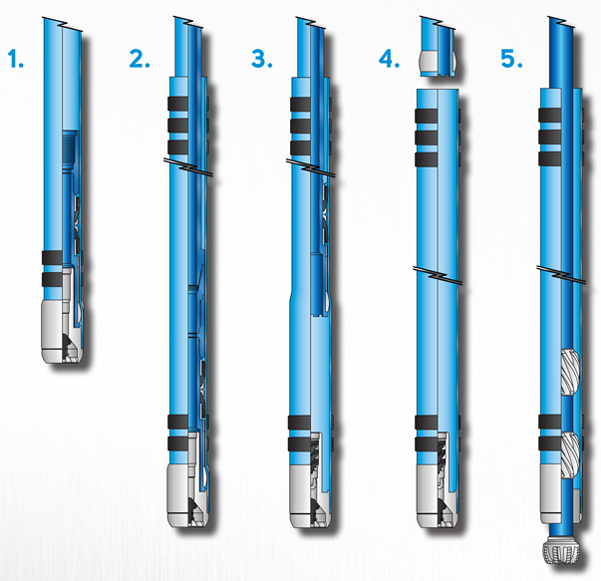 The MaxWell™ Liner provides the option of adding a casing string in cased hole or open hole environments in either planned or contingency scenarios with minimum loss of wellbore diameter. The MaxWell Liner is a bottom-up expansion system which uses hydraulic pressure to pump the expansion cone from the bottom of the liner to the top. The MaxWell Liner system is deployed on drill pipe inside casing sizes ranging from 4-1/2 in. to 13-3/8 in. Up to 4,000 feet of liner can be run; longer liners available upon special request. > Simplified design and lack of complex parts improves performance and reliability. > A short-length, pre-expanded launcher improves performance and reliability. > A pressure cup ahead of the cone improves system reliability by providing a secondary seal, should flow bypass the cone area. > The expandable connectors have been designed and tested under all loading conditions: tension, compression, high dogleg severities, fixed and hydraulic expansion. The connections perform capably on torque failure tests, as well as H2S exposure tests. > A connector protection sleeve prevents damage while running in hole. > Proprietary elastomeric seal design prevents O-ring displacement from the O-ring groove during pipe handling and make up. > A protection sleeve on the pre-expanded launcher prevents run-in damage. > High ductility and high fracture toughness improves the systems reliability during expansion by increasing the tubular defect tolerance. > Proprietary tubular ID coating provides low friction coefficients and excellent corrosion resistance. > Lubricant provides a working temperature rating up to 300 degrees F.
> Provide reliable and consistent sealing performance for cased-hole and cemented installations. > Tested to 300 degrees F with HNBR as the standard elastomer application. > Customized elastomer seals are available for severely corroded or irregular casing applications. > An extensive QA/QC system has been implemented to ensure consistency and traceability during manufacture of each joint and tool component. > Every joint is serialized which traces each stage of the manufacturing process: Casing manufacture, coating, threading, storage and shipping.